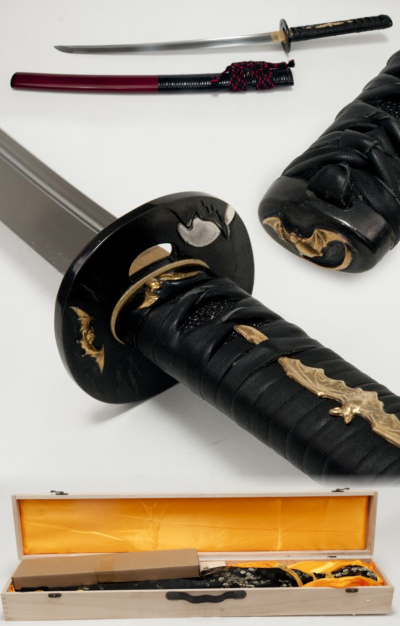 Shintogo Bat / Vampire Koshirae Wakizashi sword. Blade with bo-hi measures 21 inches from tip to tsuba. Overall length including saya about 32 inches. The Ito is Black leather over Black Rayskin. Tsuka is double pinned with bamboo mekugi, leather Ito wrapped in Katate Maki (Battle Wrap) style with hishigami paper. Weight without saya about 1.15 lbs (depending on steel). Saya is wood with deep red finish and Black ratton wrap. 3 pc bullhorn, Black/Red Sageo. Comes with wooden case , silk sword bag, wood stand with Japanese kanji for Vampire, cleaning kit.